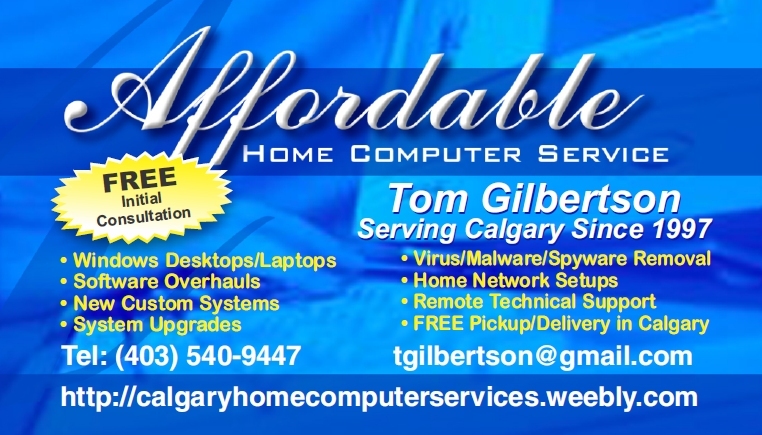 AFFORDABLE Calgary Home Computer Services Since 1997! Windows-based home computers & laptops repaired Properly, Promptly and AFFORDABLY! Average 2 to 3 day turn around in most cases. FREE Pick Up & Delivery within Calgary city limits. Please review our "SERVICES" Page for full details. If you are not happy with your current tech, give us a try and see what you have been missing. Calgary Computer Repair. Calgary Laptop Repair.